If you are headed out to Las Vegas with a big crew of friends for a bachelor party or bachelorette party or perhaps coming out for a convention with a large group of business colleagues, then getting everyone around town in one vehicle becomes an advantage to multiple taxis. There is no better way to tackle your transportation needs then with a monstrous 20 to 25 passenger super stretch SUV limousine. Without a doubt, the space that a customized superstretch SUV limo can offer is a big convenience for your group especially on a busy Saturday night when the cab line is overwhelming. We offer big limo options such as elongated H2 Hummers, extremely large Excursions and custom F-650s that would be best described as rolling party on wheels. The big duel axel 650 is enormous and will accommodate up to 25 people comfortably and safely. This large SUV limousine comes complete with every toy that a discriminating client could ask for. 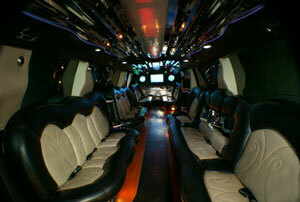 It boasts plush leather wrapped seating, premium stereo sound system with radio, CD and MP3 capability, neon nightclub lighting on the ceiling and floors, strobe lights, DVD player to watch your favorite movies and music videos on the multiple LED screens, even a smoke machine to make a grand arrival! Vegas VIP’s 20 to 25 passenger Superstretch SUV limos have been specially designed and built by the country’s top coachbuilders with safety, style, and comfort in mind. Even if you are only a medium sized group, the superstretch SUV limousine is a nice upgrade that will pay dividends when your party pulls up to hottest nightspot in such an impressive vehicle. 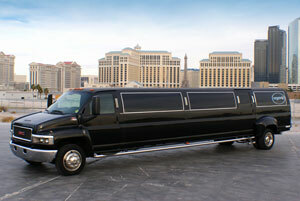 Charter the superstretch SUV limo for 4 or 6 hours, stock its bar with your favorite liquor and mixers, crank the tunes up and cruise Las Vegas blvd in your own mobile nightclub. With so many SUV limo options available, a simple call to our toll free 1-800-VEGASVIP number will connect you with one of our informative staff members. They will assist you will all of your transportation needs.